On Saturday, April 22nd, 2017, Amelia and Weston were united in marriage at the Prince of Peace Lutheran Church. 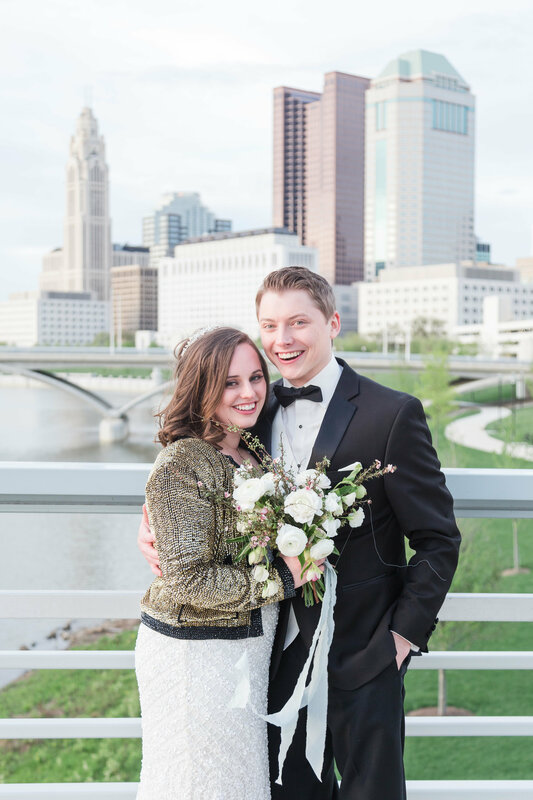 Following the nuptials, they rolled up in style by limo to the Columbus Cultural Arts Center to celebrate with family and friends. It was a brisk April day, but that didn’t stop guests from enjoying adult spirits in the paved outdoor courtyard while others took in the art on display to pass the time while awaiting the arrival of the bridal party. Bridal party members made their grand entrance to “Can’t Stop The Feeling” by JT, while Amelia and Weston crashed the room to “The Walker” by Fitz & The Tantrums. The bride’s father then delivered a nostalgic yet touching speech, offered a prayer of thanks and then dinner service began. For their first dance, Amelia and Weston embraced to “My One and Only Love” by Nancy Wilson. Following the Father/Daughter and Mother/Son dances, Alumni members from both OSU and the College of Wooster assembled on the dance floor to respectively sing “Carmen Ohio” and “Scotland The Brave”. The dance floor then opened for all guests who bumped to music from a variety of decades; even forming their own conga line to “Love Train” by the O’Jays that nearly stretched into the next county. Just shy of 10:00 pm, every guest joined the Bride and Groom on the dance floor to bid them farewell to Billy Joel’s “Piano Man”. Following their Uber exit, guests continued to dance the night away. Thank you Amelia and Weston for extending me the honor and privilege to be your DJ! Photographs complements of LZ photography.